Ireland with its capital Qeshlaq is located in Europe (Western Europe, occupying five-sixths of the island of Ireland in the North Atlantic Ocean). It covers some 70,274 square kilometers (slightly larger than West Virginia) with 5,011,100 citizens. English and Irish are the common languages used in Ireland. Interesting info United Kingdom is the only bordering country. Ireland is an island in north-western Europe which has been divided politically since 1920. Most of the island is made up of Ireland (Irish: Éire), a.k.a. Republic of Ireland (Irish: Poblacht na hÉireann). The remainder is Northern Ireland, which is part of the United Kingdom. The island of Ireland historically consists of 32 counties, of which six, collectively known as Northern Ireland, have remained as part of the United Kingdom since the rest of Ireland gained independence in 1922. For travellers wishing to experience Ireland on a budget, there are a variety of inexpensive bus tours in almost every part of the country. The landscape is mostly flat to rolling interior plain surrounded by rugged hills and low mountains and sea cliffs on west coast. The average density of population is about 71 per km². The climate in Ireland can be described as temperate maritimemodified by North Atlantic Current, mild winters, cool summers, consistently humid, overcast about half the time. Potential threats by nature are rare extreme weather events. To reach someone Ireland dial +353 prior to a number. The local cellular networks are operated on 900 MHz, 1800 MHz, 3G, 4G. Websites typically end with the top level domain ".ie". If you want to bring electric appliances (e.g. battery chaarger), keep in min the local 230 V - 50 Hz (plugs: G). The sign for the locally used currency Euro is EUR. 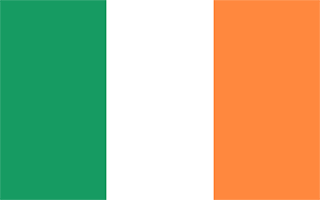 Three equal vertical bands of green (hoist side), white, and orange; officially the flag colors have no meaning, but a common interpretation is that the green represents the Irish nationalist (Gaelic) tradition of Ireland; orange represents the Orange tradition (minority supporters of William of Orange); white symbolizes peace (or a lasting truce) between the green and the orange.